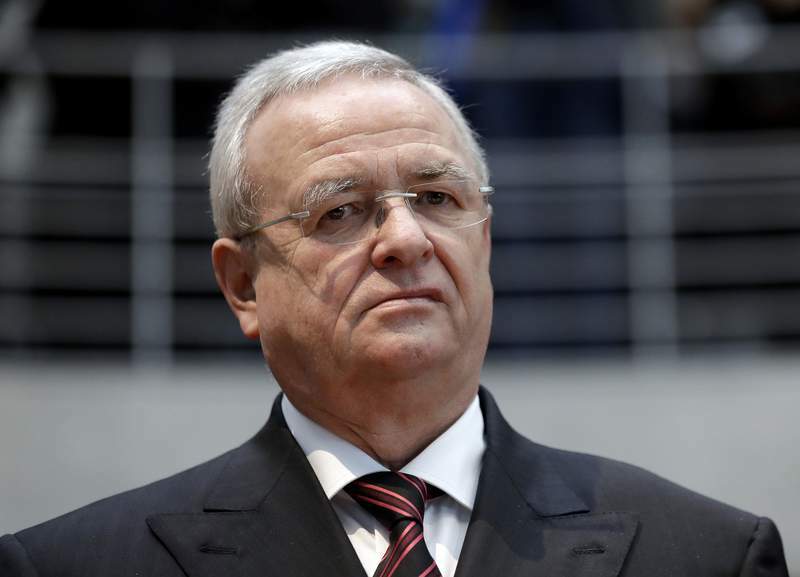 FRANKFURT, Germany -- German prosecutors have charged former Volkswagen CEO Martin Winterkorn and four others with fraud and other offenses in connection with the company's massive, multi-year effort to cheat on diesel emissions testing. In all, about 11 million cars worldwide were equipped with the illegal software, in a case that damaged the reputation of diesel technology and accelerated the shift to electric cars in Europe. Bonuses collected because of sales based on the deception could be forfeited. Prosecutors said the amount of bonuses that could be forfeited range from around $340,000 to $12.45 million. Winterkorn's attorney, Felix Doerr, said the defense could not comment because prosecutors had not given them adequate opportunity to review the case files. Doerr said in a statement that prosecutors had provided seven DVDs with 300 file folders of material, including data files the defense had not seen before, only on April 5 and that requests for a chance to review the files and make a written answer had received no response. The prosecutors' move is one of a number of legal proceedings unleashed by the scandal. First, the Braunschweig prosecutors are continuing their probe against 36 more suspects, according to Monday's news release. Lastly, investors in Germany are also seeking damages, saying Volkswagen did not meet its obligation under securities laws to give them timely notice of troubles that could affect the stock price. Volkswagen has said it met its duty to investors. The scandal unleashed widespread scrutiny of diesel emissions across the industry. It soon turned out that many models from other carmakers also emitted far more pollution on the road than on the test stand, because of egulatory loopholes exploited by carmakers such as turning exhaust controls off at certain temperatures to reduce engine wear. Diesel sales, once half the European car market, have sagged. That in turn has undermined carmakers' plans to use diesels, which get better mileage, to help meet tougher European Union limits from 2021 on emissions of carbon dioxide, the main greenhouse gas blamed for global warming. One result has been greater pressure to develop battery-powered cars to avoid heavy fines for breaching the new emissions limits. Volkswagen says it plans to spend 30 billion euros to develop electric vehicles by 2023.